The chemical platensimycin is isolated from Streptomyces platensist and was found to be effective against a whole range of nasty bacteria such as MRSA by a Merck team in 2006 in high-throughput screening program (Wang et al. DOI). Structure elucidation quickly followed (Singh et al. DOI DOI) and in a record breaking 4 months also its first synthetic racemic total synthesis by Nicolaou et al. (DOI). The compound consists of a pentacyclic lipophilic core connected through a amide group with a hydrophilic dihydroxybenzoic acid tail. This antibiotic messes with the fatty acid synthesis ability of certain bacteria enzymes. 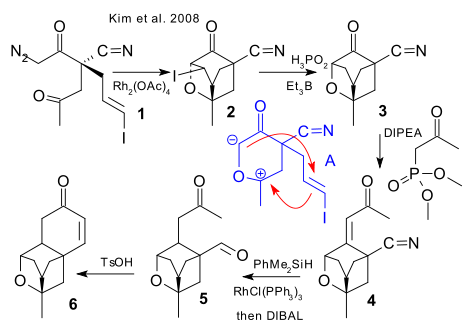 The key steps in the racemic Nicolaou synthesis are: cycloisomerization of 1 (CpRu(MeCN)3PF6), to enone 2, Saegusa oxidation(LiHMDS,TMSCl , lead acetate) to dienone 3, TBS deprotection to aldehyde 4 (HCl), single-electron reduction (samarium(II) iodide) to alcohol 5 (poor diastereoselectivity) and electrophilic addition (TFA) to ether 6. The current total synthesis count (including the formal synthesis procedures) stands at 11 fulfilling Nicolaou's prediction in his 2006 paper that no doubt many total syntheses will be reported following this one. Two more racemic formal procedures are presented by Zou et al. (2007 DOI) and Nicolaou et al. (2007 DOI) followed by the first enantioselective procedure again by Nicolaou (2007 DOI). The asymmetric Nicolaou version should be a straightforward asymmetric cycloisomerization of the same starting alkyne but this approach fails miserably. The backup plan calls for introduction of a carboxylic ester group through ketone protection (TMSOTf, base) and carboxylation (CN-COOMe/BuLi) followed by restoration of the ketone (IBX)and deprotection of the alcohol (HCl). Asymmetric cycloisomerization is now possible after all (BINAP / Rh(cod)2Cl2) but getting rid of the undesired ester group takes some additional steps. More asymmetric synthesis followed in 2007 and 2008 by Kalliappan et al. (2007 DOI), Li et al. (2007 DOI), Ghosh et al. (2007 DOI) Lalic / Corey (2007 DOI), (Kim et al. 2008 DOI). 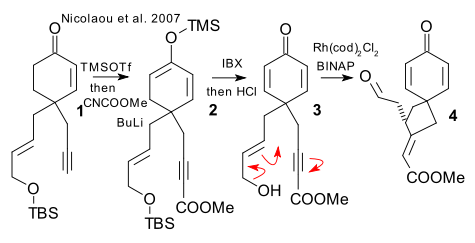 The Kim synthesis is based on conversion of chiral diazoketone 1 with rhodium(II) acetate to tetracycle 2 in a cycloaddition with key ylide intermediate A followed by hypophosphorous acid/triethylborane mediated removal of iodine in 3 (iodine is in it to change alkene electronic footprint), Horner-Emmons reaction to 4, Rhodium(I)-catalyzed hydrosilylation and DIBAL reduction to 5 and finally acid catalysed Aldol condensation to 6. More variations: protective group free by Tiefenbacher et al. (2007 DOI) and a chiral pool synthesis (Nicolaou et al. 2008 DOI). 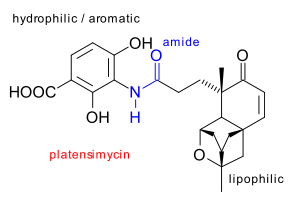 In addition, the platensimycin biosynthesis has been elucidated in a so-called feeding experiment whereby the bacterium in question is fed isotope labelled nutrients (Herath et al. 2007 DOI). A possible biosynthetic precursor has also been isolated (Jayasuriya et al. 2008 DOI). Be prepared for more synthetic frenzy for its cousin platencin.